Son of Alexander II, and a direct descendant of the first king of the Scots, Kenneth mac Alpin, Alexander was born at Roxburgh in 1241. On the death of his father, Alexander II (who died during an expedition to recover the Hebrides from King Haakon IV of Norway) Alexander III was crowned king at Scone in 1249 when he was eight years old. Two years later, he married Margaret, daughter of King Henry III of England. He had been engaged to her from infancy. He became a strong ruler and as a result of his marriage there was little conflict with England. He successfully defeated an invasion by King Haakon of Norway at the Battle of Largs in 1263. Following this, the Treaty of Perth transferred the Hebrides and the Isle of Man to Scotland from Norway. As part of the peace-making, his daughter married Haakon's grandson, Eric II - their daughter Margaret later became Queen of Scotland. 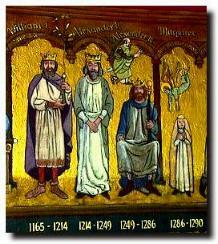 His wife died in 1275 and the death of his sons, David in 1281 and Alexander in 1284, left him without a male heir. Alexander married a second time in order to produce a direct heir. His bride was Yolande of Dreux, but on 19 March 1286, within six months of his marriage, his horse stumbled in the dark in Fife as he was returning to his wife and he died at the foot of the cliff. His grand-daughter Margaret, the "Maid of Norway" became Queen of Scotland at the age of three. She was the last of the direct line of the House of Canmore. She left Norway to come to Orkney in 1290 but died on the voyage, before reaching Scotland, plunging Scotland into a long period of conflict for survival as an independent country in the "Wars of Independence".